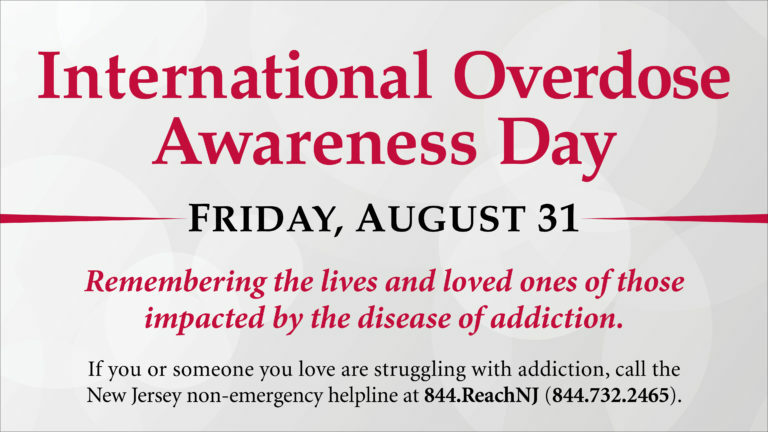 Cooper’s Addiction Medicine Program encourages staff and the community to take time on Friday, August 31, 2018, for International Overdose Awareness Day to learn more about addiction, its effect on families and the community, and efforts to reduce overdoses and death. The day is also an opportunity to stimulate discussion about evidence-based overdose prevention and drug policy. International Overdose Awareness Day, established in 2001 in Australia and now recognized around the world, also acknowledges the grief felt by families and friends remembering those who have died or suffered permanent injury due to drug overdose. The observance also spreads the message about the tragedy of drug overdose death and that drug overdose is preventable. Globally, there is an estimated minimum of 190,900 premature deaths caused by drugs, and opioids account for the majority of drug-related deaths and in most cases such deaths are avoidable. North America continues to experience the highest drug-related mortality rate in the world, accounting for 1-in-4 drug-related deaths globally. Visit International Overdose Awareness Day website to learn more. The Addiction Medicine Program, a program of Cooper University Health Care’s Urban Health Institute, provides compassionate, top-of-the-line medical care and comprehensive addiction treatment services for Cooper patients with substance use disorders and chemical dependency throughout the continuum of inpatient, outpatient, and chronic care settings. To learn more about Cooper’s effort, click here. The Cooper Foundation has a specially-designed fund to support Cooper’s Addiction Medicine Program. To support that fund, visit the donation page here and choose Center for Healing and Addiction Medicine. The state of New Jersey maintains a non-emergency helpline – Reach NJ – that offers 24-hour service focused on addiction, and serves as a one-stop shop to simplify the process for those seeking help. Call 1-844-ReachNJ (1-844-732-2465). In a crisis, if you, a friend, or a family member are in need of immediate assistance, call or text 911.